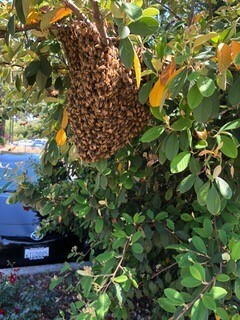 The Honey Ladies in San Jose does safe bee, wasp and yellow jacket swarm removals from all types of structures, inculding vehicles.. We do not TRY to do live removals, we ONLY DO live removals. We have competitive flat rates for each type of job, and do not charge extra for live swarm removal. Putting passion into action, removing swarms is our core business value. The Honey Ladies offers a LIFETIME GUARANTEE. 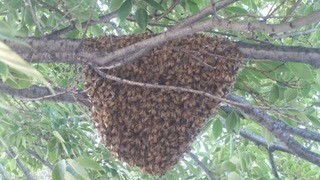 If any bees return to the location of the original warm removal, we will remove them at Zero cost to you. IIn a nutshell it’s the bee colonies’ way of reproducing. Yes, the Queen lays eggs which hatch into bees but that’s just to maintain the population of the hive. It isn’t the same as us having children who go off and set up home somewhere else. It’s more accurate to think of the hive as one individual, rather than a collection of thousands of individuals. None of those ‘individuals’ could survive by themselves for very long or start a new hive. A swarm is analogous to a child, calf, chick, or puppy. It is the offspring of the hive. The workers select an egg or two to become the new queen, often it is more than one, since it’s safer to have more than one option. Just before the new queen hatches, the old queen leaves the hive and flies off with a large portion of the workforce. 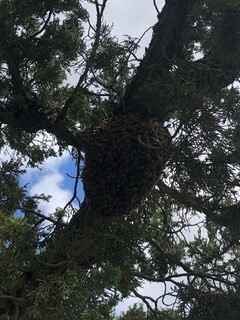 This is what we call a swarm; it collects on a convenient tree limb, the eves of a building, or any other object temporarily. The swarm will sometimes stay there a few hours or sometimes days. While it’s there, it will send out scout bees which look for a suitable new location. The scout bees return and do a dance to report their findings and recruit other scouts to go and take a look. Once enough scouts agree on the new location all the bees take to the wind and fly to the chosen new location. 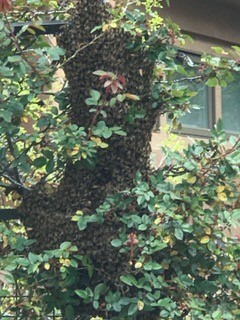 Occasionally the urge to start building a hive is so strong, they start building combs right there in the tree. Building honeycombs in such an exposed place doesn’t make sense to us but they don’t ask our opinion, they just do it. The Honey Ladies have Emergency Same Day Services available 24 hours a day, 365 days a year. We understand every minute counts when it comes to the safety of your family, pets, employees or tenants or the possibility of a life threatening allergic reaction! We specialize in safe, live swarm removal without the use of dangerous chemicals. This process requires a skilled professional trained in the handling of bees and their Queen Bee so only minimal damage is done to the bees, the hive and the handler. And, unlike other companies, we do not charge extra for live bee removal. We also specialize in organic or green beehive removals. We provide the services you need immediately.Contact Us Today! Give us a call at (408) 531-5045 or use our inquiry form by CLICKING HERE!